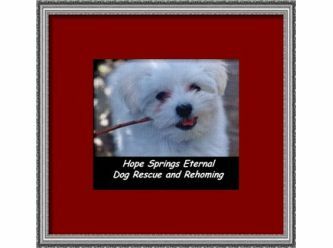 Hope Springs Eternal Dog Rescue, Rehoming & Retirement (HSEDRRR) is a newly formed organisation based in the Adelaide Hills. We will work across Adelaide Metro area, and within a four hour radius of Adelaide. We aim to assist with rehoming of small dogs who need to find a new family due to unforseen circumstances. Hope Springs will ensure that all dogs that come into care have a health assessment and receive all medical care they require. No dog will be adopted unless they are desexed and microchipped. Time will be taken to get to know each dog and assess their temperament and personality so that they can be matched with the perfect family. We hope to work collaboratively with other rescues and animal shelters and to work with integrity, ethics, high standards and a high level of accountability - keeping the best interests of the dog at the forefront of our actions at all times. We hope to educate and encourage commitment and responsible pet ownership. We aim to create a group of passionate and motivated animal lovers who share our ideals and goals and also want to make a difference. We aim to look after our group members as well as we look after our dogs. We hope to share the joys of doggy love with people who are not able to have a dog as a companion and will - where funds permit - take on dogs who need a comfortable place to retire, and fund their medical care. Where we have the capacity or the funds - we will assist people with pets, who are doing it tough and may require some short term help with their dogs costs or with short term accommodation where their owner may need to go into hospital or away. Above all - we seek to do no harm - and to assist other families to experience the joy and love that adding a dog as a treasured member of their family - brings.